Rovers defender Charlie Clough hit his first goal of the season to give his side victory over Macclesfield. 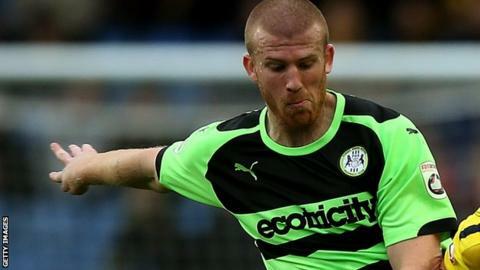 Charlie Clough scored a last-gasp winner to give Forest Green Rovers victory over Macclesfield. The visitors took the lead in the second half through Jack Sampson following an error from the home side. But James Jennings pulled the hosts level eight minutes later when he latched onto Elliott Frear's free-kick. Clough broke Macclesfield hearts in the third minute of added time when he found the net from close range to keep Rovers on top of the National League. "I thought we should have scored four or five in the first half from set-plays, but we just needed to be more ruthless in front of goal. "Macclesfield are a good side hanging around the play-offs so it's a massive win for us and caps off a fantastic week. "There's unbelievable togetherness here and it's showed with the way we're playing this year. Let's just hope it continues to the end. "We've got a tough month ahead but let's enjoy these times because we've won six out of six in January - enjoy it while we can and look forward to February." Match ends, Forest Green Rovers 2, Macclesfield Town 1. Second Half ends, Forest Green Rovers 2, Macclesfield Town 1. Goal! Forest Green Rovers 2, Macclesfield Town 1. Charlie Clough (Forest Green Rovers) right footed shot from the right side of the six yard box to the bottom left corner. Assisted by Sam Wedgbury with a cross. Attempt blocked. Charlie Clough (Forest Green Rovers) right footed shot from the right side of the six yard box is blocked. Assisted by Sam Wedgbury with a cross. Offside, Macclesfield Town. Reece Styche tries a through ball, but Reece Styche is caught offside. Substitution, Forest Green Rovers. Jon Parkin replaces Kurtis Guthrie. Attempt saved. Reece Styche (Macclesfield Town) right footed shot from outside the box is saved. Jack Sampson (Macclesfield Town) wins a free kick. Substitution, Macclesfield Town. Chris Sutherland replaces Chris Holroyd. Foul by Marcus Kelly (Forest Green Rovers). Goal! Forest Green Rovers 1, Macclesfield Town 1. James Jennings (Forest Green Rovers) right footed shot from the left side of the six yard box to the bottom right corner. Assisted by Elliott Frear with a cross. Attempt blocked. James Jennings (Forest Green Rovers) right footed shot from the left side of the six yard box is blocked. Assisted by Elliott Frear with a cross. Substitution, Forest Green Rovers. Marcus Kelly replaces Keanu Marsh-Brown. Substitution, Forest Green Rovers. Darren Carter replaces Brett Williams. Attempt missed. Rob Sinclair (Forest Green Rovers) left footed shot from outside the box is too high. Goal! Forest Green Rovers 0, Macclesfield Town 1. Jack Sampson (Macclesfield Town) left footed shot from the left side of the box to the bottom right corner. Foul by Charlie Clough (Forest Green Rovers).